Types of wines: Simple, light-bodied, crisp red when vinified simply. From top sub-regions and producers, can be rich, complex, elegant and long-lived. Also produces dry, stylish rosés. Origin: The "blood of Jove" is most noted, in various clones, for the production of Tuscany's CHIANTI, BRUNELLO di MONTALCINO, VINO NOBILE di MONTEPULCIANO and MORELLINO di SCANSANO. In Marches a different clone is blended to make ROSSO PICENO and ROSSO CONERO. Yet another clone is the basis for all the red DOCs (high-quality growing regions where varieties and yields are regulated by the government) of Umbria (with the exception of Sagrantino di Montefalco). So it is easy to see that the Sangiovese grape, the most important in central Italy, can be many things. However, the most revered wines are those of Tuscany's rolling hillsides. The seven regions of Chianti utilize the Sangioveto clone and require blending with recognized red cultivars, Cannaiolo and Malvasia Nera and some white grapes, Trebbiano and Malvasia Bianca. Montalcino wines are made with 100% of the Sangiovese Grosso clone but the Montepulcianos allow Cannaiolo and Mammolo in blends. 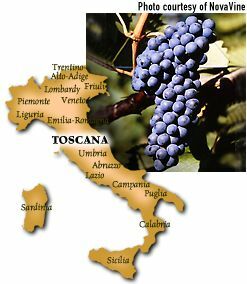 Super-Tuscan wines sidestep legal restrictions and blend Cabernet Sauvignon, Merlot or Syrah and age the wine in small French oak barrels. Such wines are less Italian and more international in style and are marketed with proprietary names (eg. Sassicaia, Solaia, Tignanello) and are usually very expensive. Great care must be taken by the vintner when blending Sangiovese as its own expressive character can be easily overwhelmed by other varieties or excessive oak extraction. Description: Bright aromas and flavors of raspberries and strawberries with typical racy/lean acidity and mild tannins predominate in the lighter to medium-bodied Sangioveses. Darker, more robust and extracted wines with wild raspberry and violet nuances generally originate from cooler growing regions. Moderate tannins add to the fruitiness and naturally high acidity and give the wines additional complexity and length. Aging: The lighter styles of Sangiovese are best consumed within three years of their vintage. The bigger wines will improve for a decade as the aroma evolves to a complex bouquet of faded roses or violets, coffee, leather and cedar. The wine goes from bright deep garnet to a more brick-red. It softens and takes on a velvety texture with a rich, multi-layered complexity that echoes the nuances of the bouquet. Best location: As in Italy, Sangiovese will thrive in most of California's vineyards. It will respond to individual "terroirs" and thereby exhibit various expressions of itself. As the wine is most often improved through blending, the conscientious guidance of a sympathetic winemaker is very important. FastFoodFacts:The bottle of Chianti with a plate of spaghetti may be a well-recognized icon, but it does not quite represent the best match-up, as the acidities of the wine and tomato can clash. Besides, tomato based sauces are the staple of Southern Italy. More traditionally, Sangioveses are best matched to red meats, fowl and vegetables that are roasted or grilled with olive oil herbs and garlic. An essential compliment to Extra Virgin Olive Oil, its racy acidity handles all high fats.